First Line: I know I promised Jack I'd quit smoking, but I'm a nervous wreck meeting all of these polo bigwigs. Jack Rutledge, owner of a world-class polo club in Palm Springs, has hired newlywed Marty Combs to appraise his collection of art pottery and his fiancee Pia's recently inherited art glass collection. When Pia is murdered, Marty and her husband Jeff, a Palm Springs police detective, find themselves in the middle of an investigation that has a long list of suspects-- and Marty may find herself on the victim list if she and Jeff don't work fast. Rated almost five stars on Amazon and by a seven-time Amazon All-Star Author, I grabbed Murder at the Polo Club when it was listed at 99¢. I'm glad I didn't pay more. First, the good stuff-- and there is good stuff. The story did keep me interested, I liked the main character, and the book had a good, steady pace that kept the pages turning. Those are the reasons why I finished the book. When you read what I didn't like, keep the good stuff in mind. It had to be good to keep me reading. What didn't I like? One of the main reasons why I decided to read the book was because of the setting. 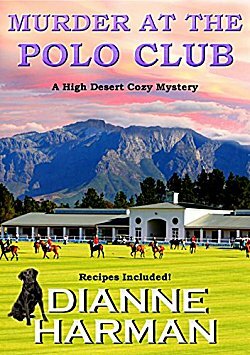 Palm Springs, California has always fascinated me-- even more so now that I've been there-- but Murder at the Polo Club could have taken place anywhere. Giving Marty a dog that won't step foot out in the desert without its pink booties isn't enough. There's scarcely anything about polo either. In addition, the writing is often very awkward. When I find myself repeatedly stopping to mentally reword something, it's not a good sign. This particular problem did improve by the midpoint, however. The suspect pool is established quickly, then obvious clues to the identity of the real killer are given throughout the rest of the book. But... would you like to know what the jaw-droppers were for me? Two glaring faults in police procedure. One, Marty breaks into the house of a suspect to steal a toothbrush to give to her husband to have tested for DNA. (At least her husband didn't ask her to do it.) This evidence would have been completely inadmissible in a court of law. Two, Marty's husband Jeff, the police detective, likes to come home every night after a hard day's work and discuss the investigation in-depth with his new bride and their friends. Another huge no no. It's good to see that the author has a loyal fan base that enjoys her books. I, however, won't be joining them.